Heights athletes raise pens for the ceremonial National Signing Day, where they commit to play a sport and study at a college or university. On Feb. 5, 19 Heights High student-athletes signed letters of intent to officially accept college athletic scholarships. 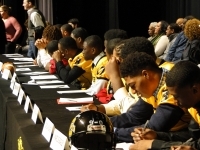 The February ceremony at Cleveland Heights High School has become an important tradition for many of the school’s teams. The football team had a strong showing, with 16 seniors on the auditorium stage. Jeff Rotsky, the team’s coach, expects at least five students will play at Division III schools. “We have one of the largest numbers of athletes signing in the Cleveland area,” said Rotsky. Building a winning team is very important to the coach. “However, building men of character and sending our young men to college is really our top priority,” Rotsky added. There were three girls at the signing table. Basketball player A’Shanti Abshaw, who averaged 21 points per game and has scored more than 1,000 points in her high school career, will attend Cleveland State University. Diver Ellen Posch, currently ranked second in the state, will attend Georgia Tech. Soccer player Kalah Saunders, who earned a record of 53 goals and 50 assists during her high school career, plans to attend Lake Erie College.